With three days before the crossing, yesterday we had our last long training session. We agreed swim twice a day: early, before breakfast, and after dinner. The night before we had invited Rohan More and his team—his mother and a friend. We were packed in tight, with Nora and Pablo stuffed into the back, but all we fit into the truck. I could not stop bothering them and giving them instructions, as I do with Toffee and Brownie when they’re in the car with me. On the way we chatted like open water swimmers always do. What crossings have you swum? What are the difficulties you’ve faced? What’s next for you? Rohan More is one of the Indian swimmers who are questing after the Ocean’s Seven. Last year he did Catalina, the English Channel and the Molokai Channel. This year he swam the North Channel in August and will attempt Tsugaru in the morning. Our first attempt to swim in the morning was a failure. The wind changed direction and there was no way we could even get to the protected part of the beach. We decided to go to Yositune Seaside Park, which is about 20 minutes away. It was a good decision, because when we arrived the water was almost like a mirror. We started swimming in the protected area and after a while went out to the open sea. Nora and Rohan began to increase speed, but I decided to wait until the return leg. After 45 minutes we returned to the beach. Good swim. Back at the hotel we found out that at 2:00 in the afternoon Rohan would meet with the official who was qualifying of his swim. He wouldn’t be able to join us for today’s second training session, but I was pleased to know that his window had opened, with mine following. 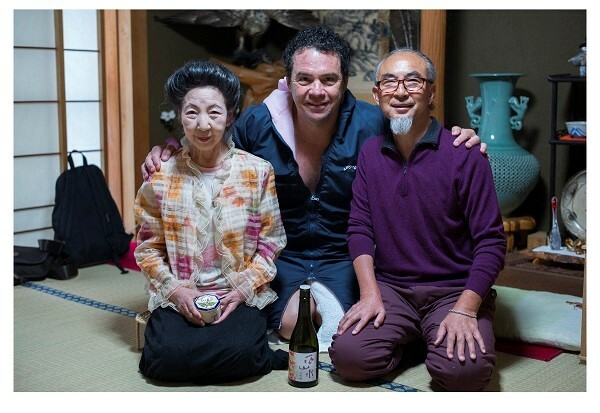 Mealtimes are the ideal venue for Guillermo to give us classes on different topics related to Japan. Yesterday we talked about classical music, jazz, painting and, his particular passion, photography. Regarding Classical music his comment to us was that, although the interpretation may be technically flawless, it is generally lacking in true emotion. Not so in jazz, where improvisation—and with it, feeling—flows freely. What he said about painting is quite interesting. Japanese painting apparently has not achieved the acclaim it deserves outside its borders. I learned that Foujita, Tamiji Kitagawa, Taro Okamoto and Isamu Noguchi (half Japanese, half American) had all lived and developed their oeuvre in Mexico. Photography has been one of the arts that have been most developed in Japan in the twentieth century—not simply the technical side of the medium, but in the unique expressive development in these latitudes. It can be argued that contemporary photography as a whole has its origins in Japanese photography of the sixties. We learned about great masters such as Daido Moriyama, Eikoh Hosoe, Takuma Nakahira, Nobuyoshi Araki and Kawada Kikuji. Pablo and I are excited to go in search of photo books of some of these artists on our return to Tokyo. At 3:00 p.m. we left for the second swim. With somewhat stronger winds the sea was a moving more. We swam the same route as in the morning, but decided to increase our speed and see how I felt. I got a good rhythm and arm pain did not go beyond its normal intensity. It will be an issue on Tuesday, but I hope I can handle it. Within 30 minutes I decided I had finished with the swim. Nora does not like when I change our workouts, but I had started to feel dizzy and felt the session had done what I wanted. Pablo took the opportunity to take some pictures. We agreed that we need a new lens to take good pictures of the swim. It’s something we’ll negotiate with the Ing.Argüelles, who will surely agree to support the project. Once I was out of the water I saw a lady collecting rocks on the beach. I asked Paul to take a picture. I was going to explain through signs that I wanted to take a photo with her when Pablo interrupted me and, asked the question in perfect Japanese. Surprised, the lady replied, go ahead—and started asking questions in return. We laughed and now both made signs indicating that we did not understand. As we were leaving the woman came to us and offered Nora to come to her house to take a bath. Well, we think that’s what she said, as we were without William to translate for us. We thanked her through signs, got into the car. Just as we were pulling out, the lady came running with a bucket of hot water and offered it to us. Nora, who had already taken off her suit, had to put it back and throw a splash over herself in order not to not offend our new friend. We watched and we noted that, wherever you go, there are good, kind and loving people. I think to myself how this trip has provided me the space to enjoy an inner peace that’s difficult to experience in the day-to-day Mexico. Mrs. Saiko helped.